Here, I'm sharing my wonderful experience of visiting Lonavala last year and exploring the best tourist attractions of Lonavala. My travel buddies and I also signed up for a Della adventure package which was one of the highlights of our trip. To say that my trip to Lonavala was exciting would be the understatement of the year. Because it wasn't just exciting, it was like an out of this world experience in my life. And it all started with some boss-bashing with a colleague and the desire to take a break from work and travel for a change. So my two friends and I booked a 1-star resort near Lonavala station and set off into the sunset. In this case, our metaphorical sunset was a smelly sleeper-class train bogie which did not have seats for us. For the initial couple hours of the journey, we sat cramped together in one seat, eyes constantly roving around in search of someone on whom we could cast our web of lies and innocence. Luckily, it all worked out in the end – we managed to get seats and slept the hours away until we reached our destination. The view from the train to Lonavala is extremely beautiful. In the morning, we sat silently by the barred window, letting the wind tangle our hair, staring out at the amazingly green and foggy landscape outside. It was a surreal feeling, gazing at all that fresh greenery. Having only heard about the place for so many years but never having the chance to visit it, even at that moment I was having a hard time believing that I was in Lonavala. When my colleague was pre-booking Ferreira Resort for our trip, she had teasingly informed me that it was a 1-star resort and I felt great pleasure in telling everyone who would listen that I would be staying in a grimy single star hotel, partly because it made everyone laugh and partly because I was proud of myself for arranging a shoe-string budget tour. After all, I was traveling for the sake of traveling, not because I wanted to click some selfies of myself standing in a lavish hotel lobby. So imagine my surprise when I beheld the cozy little resort for the first time, with its tiny lobby area and the clean rooms and yummy breakfast sandwiches and the shrewd, yet friendly, receptionist. The entire place felt like a home away from home. Our room was merely steps away from the lobby. If we wanted something, all we had to do was open our door, take a step out, holler out to the receptionist and he would oblige within minutes. 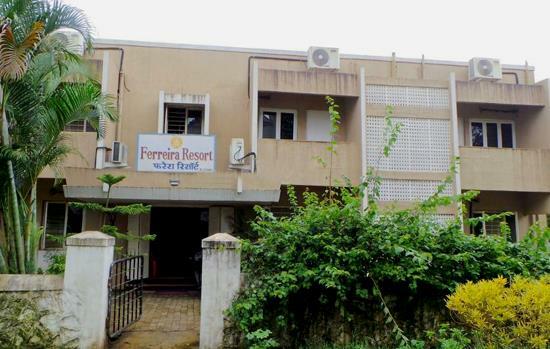 We were accommodated in an A/C room but we didn't need it at all, the climate was cool and pleasant and we took full advantage of the hot water supply. After spending 2 comfortable nights in this hotel, I would be ready to take on the world again. The day of our arrival, we went on a tour of Lonavala's most popular tourist attractions. We already had a list of places we wanted to visit but the cabbies there had a different plan in mind and we ended up going to places we didn't want to go to, like the wax museum and the Narayani Dham temple. 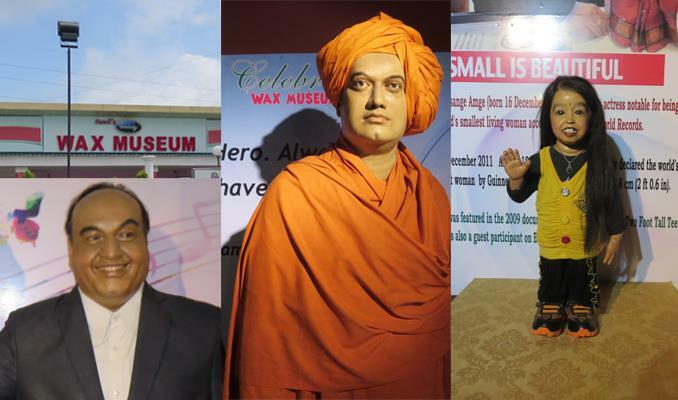 It turns out, the wax museum in Lonavala is actually pretty neat. Since it was the first wax museum I had ever visited, I had no doubt that I would be awed, even if the wax statues were badly made. Imagine my surprise when my friend, who has seen the Madame Tussaud's Wax Museum in Hong Kong, never once made a single comparison between the two and was just as awed being there as I was. We spent our time there molesting wax statues and clicking photos of our crime. Next, we went to the Buddhist shrines of Karla Caves, famous for its amazing rock-cut architecture and lovely scenery. The caves are high up on a hill and I was shocked to know that we'd have to ascend 200 steps to get to the caves. I almost gave up then and there but I had both my friends to boost me. I must have taken at least a dozen stops climbing up and by the time we reached the top, I was panting with sweat dripping from my entire body. Looking at the positive side, we did get quite a few good pictures of the scenery on our way up. The other positive was obviously a huge monument itself, standing majestically atop the hill despite being thousands of years old. The main cave featured beautifully sculpted men, women and animals, and also a gathering of sorts where a woman was imparting her knowledge of these caves in another language. We stood there for a while, trying to understand what the woman was saying, but eventually gave up and proceeded to see the other smaller caves, which were just as tranquil, vintage and sweet-smelling. In the end, it was completely worth the exercise to the top. Karla Caves is a must-see attraction if you ever go to Lonavala. This is the perfect moment to 'fangirl' over my experience at Lion's Point because it is an absolutely brilliant place. Since the day we decided we were going to Lonavala, we wanted to go to Lion's Point. I'm pretty sure the place has a couple of more names but I can only think of Tiger's Leap and I don't even know if that's true. Either way, it was a great experience. The view from the cliff is amazing. We visited the cliff for a total of three times during our trip. The first time, it rained and we were soaked; it was extremely foggy and we couldn't see a thing. We had a hot corn plate in the rain as we squinted through the thick fog. The second was a midnight visit, wherein we sat surrounded by other youngster groups, bundled up in 2-3 layers of clothing and smoking flavored hookah. The third time happened because we were addicted to Lion's Point. We made our way through the twisting roads up the mountain and sat on the edge, dangling our feet over the cliff, breathing in the cool air and feasting our eyes on the lovely views. On our way back from Lion's Point, we stopped at Bhushi Dam. While we only spent a minimal amount of time there, we soon realized that it is an adventurous and fun place. I know about the accident to death ratio of Bhushi Dam but that is not what stopped us from jumping in the water and splashing each other like little kids. We were tired and cold and getting soaked in that situation didn't seem like a very good idea. My sister later visited the dam with her friends and told us that it was one of the best experiences of her life. I've been to Fantasyland, I've been to Imagica, I've even been to Sunway Lagoon in Kuala Lumpur and Universal Studios in Singapore but none of these adventure and theme parks can compare to the crazy fun we had at Della. The park is divided into 6 alphabetical zones and we started with the last zone, opting for rappelling, crossbow and zip line first and then going on to do all kinds of activities including (but not limited to) roller zorbing, rocket ejector, foosball, virtual gaming, archery, horse riding, dog walking, cow milking and trike riding. I have fond memories of each and every activity. The crossbow string broke and it backfired in my face. I kept shooting in another person's range in archery. My horse was the only female in the lot and had a tendency to walk sideways for no apparent reason. My cow refused to be milked and kept moving in irritation. My foot slipped when I was 30 feet up in the air, walking on a rope. And the best memory of it all was that all three of us came out of it alive. Exhausted, but alive. After participating in all of those activities and more, I felt like I had achieved something. I'll never forget my adventure at Della. We spent three wonderful days in Lonavala. We bought yummy fudge and chikki boxes for everyone at home and although I would love to go back to that place, I am happy that now I can strike off one more destination from my travel bucket list. I guess it's time to plan another trip. Lonavala was once the hub of Hindi cinema. I remember the days when Amjad Khan the villain from Sholay film drives through the lonavla ghats casually. Crowds gathered to watch a glimpse of Rajesh Khanna or Hema Malini passing through in open Chevrolet Impala's. That's all history now. Today, Lonavla, Khandala and other regions are really common tourist destinations. Konkan region has much more tourist potential including Goa's coastal regions. I also wanted to know whether this site covered Mumbai city Sanjay Gandhi national park and all? Good article about tourist attractions of Lonavala with detailed information and scenic Pictures. Lions point is one of the best destinations in Lonavala. Visit this places only at monsoon and winter season. Breathing and scenic views will definitely make you visit again.